Born in Brooklyn, New York in 1955, and now residing in Bedford, England, Lynn Serafinn is an award-winning transformation coach, book promotion coach, teacher, motivational speaker, talk radio show host and author of the bestselling book The Garden of the Soul: lessons from four flowers that unearth the Self (April 2009).She is also the host of the weekly radio show on BlogTalkRadio entitled "Lynn Serafinn's Garden of the Soul." With an extensive background in Indian spirituality and the music industry, Lynn has been everything from a symphony violinist and opera singer to a world music artist, independent record label owner and chart-topping electronic trance artist. Having used technology as a creative tool for decades, Lynn's excellence as a teacher in the field of music technology was recognised in 2005 when she received the Microsoft UK Innovative Teacher of the Year Award. Lynn's diverse background brings a depth to her work as a coach, and these days she is internationally recognised as a dynamic and passionate workshop leader with a passion for helping others discover and step into their "inner hero." -- many others to be announced soon. 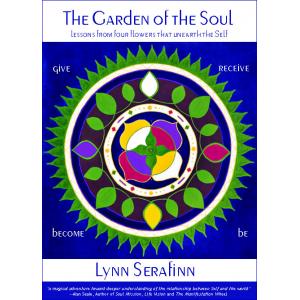 Lynn's success in book promotion is due to her applying a new "spiritual" paradigm to marketing. She believes the "old paradigm" of marketing is making our society ill--emotionally and physically--and she speaks internationally on the subject of spiritual / new markeitng. Her highly anticipated book, The 7 Graces of Marketing, which explores a fresh, new paradigm, will be released in mid 2011. In addition to her rich working life, Lynn volunteers for the Transition Town Network, hoping to help others make the shift away from petroleum dependency and back to a more reconnected relationship with the Earth. She is currently engaged in a Garden Share project encouraging communities to produce food crops in their home gardens. Of all her many roles in life, her favourite is as "Nana Lynn" to her young grandson. The Garden of the Soul: lessons from four flowers that unearth the Self is a book about becoming whole… Called ‘as spiritual as Deepak Chopra and as magical as Paulo Coelho,’ The Garden of the Soulis a journey on the ‘path of least resistance to the Self’ through the imagery of four flowers that represent four spiritual principles: ‘Give’ (the Rose), ‘Receive’ (the Iris), ‘Become’ (the Daffodil) and ‘Be’ (the Lily). Taking the reader on a daring and magical journey through the author’s life and imagination—from stage fright and burnout in a classical music conservatory, to life inside an Indian temple, to a hidden life of domestic violence, to finding inner peace atop an old English footbridge—The Garden of the Soul explores birth, death, love, art, spirituality and transformation in an eloquent, poetic and ultimately unforgettable way. It is an open invitation to readers to explore how they are already the heroes of their own lives. Within the first few days of its release, the book attained Amazon bestseller status in both the UK and US in the New Age, Mind-Body-Spirit, Spirituality and Self-Help categories.